FibroAMJ Day-Time Formula is the most scientifically advanced and complete formula ever developed for the fight against fibromyalgia. This formula contains powerful metabolites and herbal extracts that help in tissue and joint repair, and energy production. Fibromyalgia is a syndrome characterized by widespread musculoskeletal pain and tenderness at specified sites, fatigue, migraines, muscle weakness and unrefreshing sleep. FibroAMJ Day-Time Formula is a 4Life™ proprietary supplement, backed by the latest scientific research. This unique formula contains a powerful blend of ingredients that are essential for proper muscle and joint health. 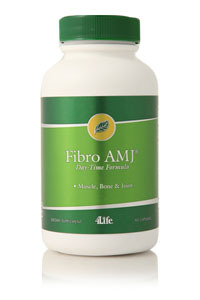 Fibro AMJ Day-Time Formula supports increased energy levels throughout the day. Multiple clinical studies indicate that daily intake of glucosamine can promote fantastic joint and muscle health as it works naturally within your body. This formula includes magnesium and malic acid, two ingredients essential to the energy production cycle. Bovine cartilage promotes cartilage production, necessary for healthy joints and tissues. Boswellia serrate is an important component of the formulation for its ability to support healthy inflammation levels.